In celebration of National Engineers Week (Eweek), the College of Engineering and Computer Science will host a variety of speakers and activities beginning on Sunday, Feb. 17. The events will bring engineering and computer science students and alumni together, and promote engineering disciplines to the broader campus. All members of the University community are welcome and encouraged to participate. Door prizes will be awarded at many of the events, with a grand prize drawing at the conclusion of the Eweek where students can win an Amazon Fire TV Stick, Echo Dot or a Bluetooth portable speaker. Challenge your peers in a variety of academic, design and fun challenges. A Route 44 event. Are you the King of the Hill? Are you the Queen that reigns? Put your brain to the test! Paper airplanes, Jenga, Math-a-thon, snacks and more! Serve the campus community by stocking the Hendricks Chapel Food Pantry with food and personal care items. Drop off non-perishable food and toiletry items in the collection boxes throughout Link Hall and the Center for Science and Technology. Are you due for a career checkup? Stop by one of the Career Clinics during Eweek to speak to a career advisor to make sure you are on track with all things career-related. To attend, search “ECS E-Week Career Clinic” under events in Handshake or stop by the lounge outside the Link Hall elevators during the clinic. Dates and times are listed in the schedule of events below. Build heart rate and ECG monitors for developing countries. Hear ECS faculty and undergraduate students present and discuss their innovative research. Learn more about how to get involved in an extracurricular activity and meet other students that share similar interests. Come together as women studying STEM to create self-portraits. At the end of the event, the floor will open for people to share what they painted and why, and share a dialogue of experiences as women in STEM. An Engineering Meets Business presentation about creating your own venture and job right out of college. A Route 44 event. The Order is a symbolic organization that seeks to promote professionalism among engineers. It is a prestigious fellowship of engineers dedicated to the practice, teaching and administration of their profession. Senior engineering students graduating May 2019 to December 2019 are eligible to participate. Register in person in 121 Link Hall through Feb. 15. There is a $12 induction fee. Senior computer science and systems and information science students graduating May 2019 to December 2019 are eligible to participate. Register in person in 121 Link Hall through Feb. 15. There is a $10 induction fee. Before you head to the Dome to cheer on Syracuse University vs. Duke, get ready for game day with some delicious tailgate fare, drinks, school spirit giveaways and a chance to snap a photo with your favorite mascot, Otto. Students from the Invent@SU invention accelerators will be on hand to demonstrate their incredible original inventions. The STEM charity ball is an annual philanthropy gala in which all proceeds are donated to nonprofit organizations that promotes STEM. This year’s event will benefit the Milton J. Rubenstein Museum of Science & Technology and Girls Inc.
Open to all Syracuse University students. $5 tickets are available through the Schine Box Office starting Feb. 11 up until the day of the event or until tickets are sold out. 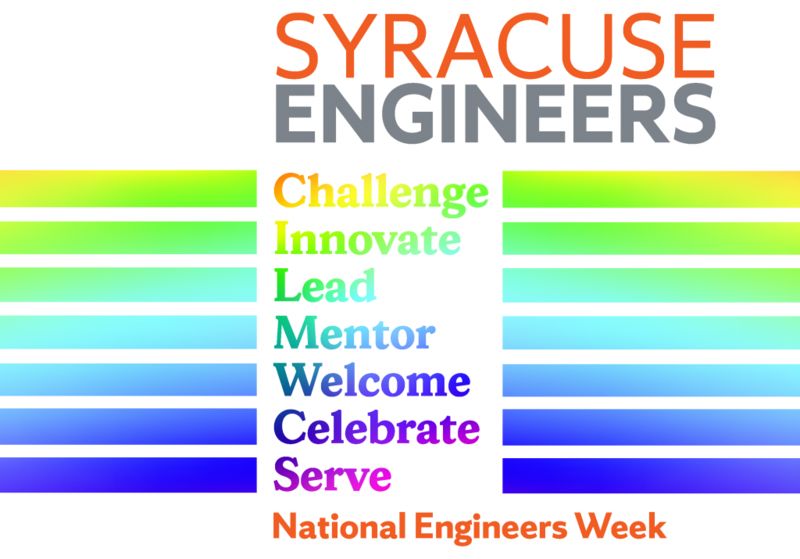 Today, Eweek is a formal coalition of more than 70 engineering, education and cultural societies, and more than 50 corporations and government agencies. Dedicated to raising public awareness of engineers’ positive contributions to quality of life, Eweek promotes recognition among parents, teachers and students of the importance of a technical education and a high level of math, science and technology literacy, and motivates youth to pursue engineering careers in order to provide a diverse and vigorous engineering workforce. Each year, Eweek reaches thousands of schools, businesses and community groups across the United States.